I loved the first in this series so was eagerly anticipating falling in love again with the characters and settings in this one - and I wasn't disappointed! The perfect romance read, full of lots of lovely bookish references and hope for all of those who believe in love finding a way, no matter what obstacles you may put in the way!! 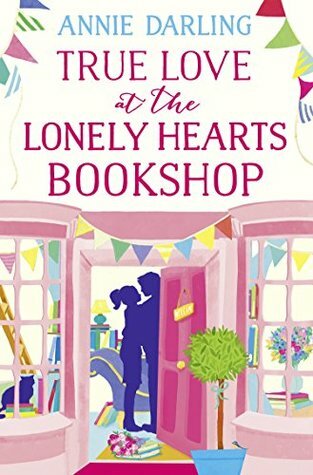 This is the story of Verity Love who knows runs the Happy Ever After bookshop, and it's still nice to catch up with the other old characters from the previous story who became like friends after reading the first in the series! Although this still can be read and enjoyed as a standalone! Verity is the epitomy of an introvert, preferring the company of books and her rather fabulous but needy cat, Strumpet, and just a few close friends. She likes having routines and one of those is dining along in a nearby restaurant where even the owner knows her needs as a diner! The problem she has is convincing her friends that she's happy this way, and has pretended to have the most fabulous boyfriend, who exists only in her dreams. So when she meets a fellow single diner in the restaurant one day, Johnny, who helps her out of a sticky situation, they soon find that they both could use each other as their 'fake other halves' to keep their friends and families from sticking their beaks in! I loved how their friendship evolves, and how they open up to each other about issues they both have. Johnny is a dreamboat of a 'boyfriend' although I did find him a little bit of a wet weekend at times when he kept going on about the woman he loved and lost - but still wanted! But they were still always there for each other when needed for social occasions and they brought out some interesting events to enjoy! Verity and her family and friends were all fabulous characters, her sisters particularly were so funny, and i loved all the Pride and Prejudice references - so much so that I'm going to have to read it once more to enjoy it again for myself! A really fabulous read and I am hoping there will be more in the series as I love the characters and the bookshop setting! Thankyou to the publishers and NetGalley for the e-copy in return for a fair and honest review.